Johns Hopkins University Press (Baltimore: 2010) 568 pages. The romance of the "iron horse" is a core myth in American history—indeed, my own Amish grandparents rode the rails westward to try to homestead in eastern Colorado (they failed) and my father was a railroad hobo who hopped freight trains across the country in search of work during the Depression. But there is, as it were, an underside to this part of our national myth, and that is the role that the railroads played for the racial minority communities. Those stories are being told in dribs and drabs, but now comes Theodore Kornweibel to give us an encyclopedic look at railroads in the African American experience. Kornweibel is a "twofer": he’s an emeritus professor of African American history (San Diego State) and he’s a train buff, so he’s well-placed to cover all the converging and diverging forces the railroads represented for African Americans from the mid 19th to the mid 20th centuries. 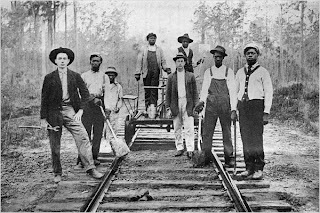 For black folks, the railroads were slavemasters, employers, Jim Crow, and freedom. And song and art. Kornweibel seems to have covered it all. From firemen, brakemen, and porters to passengers headed northward in Jim Crow cars during the Great Migration; from "Yellow Dog Blues" and "She Took the Katy and Left Me a Mule to Ride" to "People Get Ready"; from Romare Bearden and Jacob Lawrence to Sterling Brown and August Wilson, there’s a train running through it. And Kornweibel not only tells its story, but likely has a picture of it. -Gene Miller, Takoma Park Maryland Library staff. For those preferring shorter reads than Ulysses, the Friends also sponsor single discussions of shorter literary works. Copies of the story collection, Men in the Sun and Other Palestinian Stories are available in the Takoma Park Library. All are welcome to join the Friends Reading Group discussions, which are held in the Community Center at 7:30 p.m.